Taking viewers behind the scenes of swimming pool construction, two esteemed Managers of California Pools strive to create a backyard desert oasis for a Las Vegas family. A hit reality TV show "Pool Kings" premieres this Memorial Day May 30th, 2016 on DIY Network at 9:00 PM EST / 8:00 PM CST / 6:00 PM PST. Taking viewers behind the scenes of swimming pool construction, two esteemed Managers of California Pools strive to create a backyard desert oasis for a Las Vegas family. With a few decades of industry experience and friendship on their side, Mike Baldasare of California Pools | Irvine and Jim Bellamy of California Pools | Palm Desert work alongside Marv Howell of California Pools | Las Vegas to showcase the drama, integrity and skill behind the swimming pool industry. 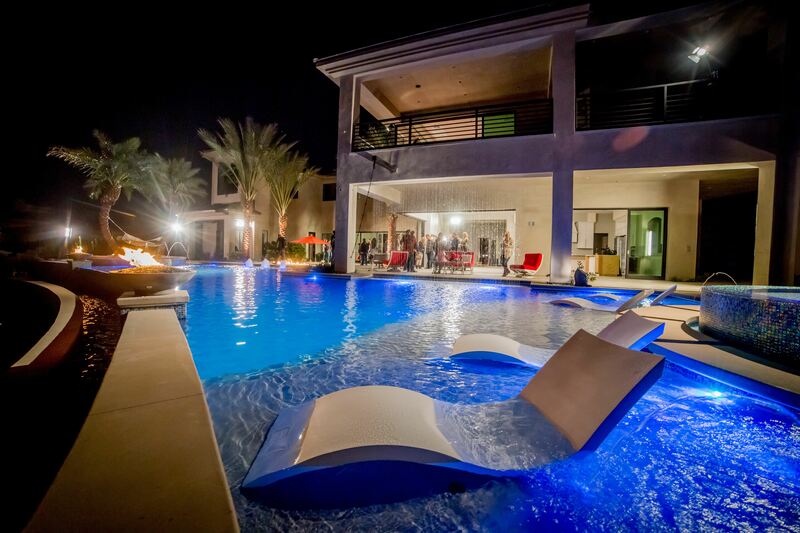 California Pools was actually one of several candidates when casting for the new reality show, but there were several factors that distinguished the nationwide organization as a builder to be crowned. For starters, California Pools represents not only volume and quality of outdoor living construction but also the company's nearly 65 years of business carries integrity and tradition. While Bellamy, Baldasare, and Howell demonstrate a long path of innovation to bring the "wow" factor to Sin City, they also bring sincerity and trust to a labor-focused business. Overall, "Pool Kings" is sure to be an eye-opening experience for viewers in one way or another. Whether it's understanding the swimming pool construction process, witnessing the challenges pool builders face day-to-day, or simply joining the California Pools story as they welcome another family into their community, there's something for everyone. 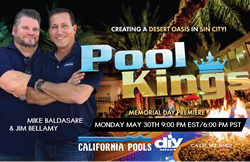 To learn more about the episode to premiere May 30th (9:00 PM EST/8:00 PM CST/6:00 PM PST) on DIY Network, visit http://www.californiapools.com/california-pools-pool-kings/. Homeowners who would like to work with the California Pools "Pool Kings" can reach them at (800) 282-7665 or visit http://www.californiapools.com anytime to schedule a complimentary in-home consultation. And finally, pool builders interested in elevating their careers and becoming "Pool Kings" themselves, visit http://www.californiapools.com/ownership-opportunities/ to learn more.